1 of 4 Heat oven to 350 degrees F. Coat 4 small loaf pans (5 x 3 x 2-inch) with nonstick cooking spray. 2 of 4 In a large bowl, mix together beef, oats, applesauce, squash, carrots, ketchup, egg, Italian seasoning, garlic powder, onion powder, 1/2 teaspoon salt and black pepper. Spoon into prepared loaf pans. Bake at 350 degrees F for 45 minutes or until internal temperature registers 160 degrees F on an instant-read thermometer. Cool slightly before turning out. 3 of 4 Meanwhile, in a large bowl, toss together sweet potatoes, olive oil and smoked paprika. 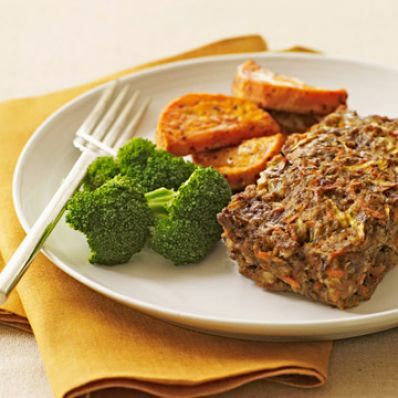 Place on baking sheet and bake with meat loaf for 45 minutes or until tender. Sprinkle with 1/8 teaspoon salt. 4 of 4 Serve meat loaf with the sweet potatoes. Accompany with steamed broccoli, if desired.